Beautiful flowers to ahmedabad. Long brass vase flower arrangement. Delivered quickly. Flowers arranged in beautiful long vase made out of brass. 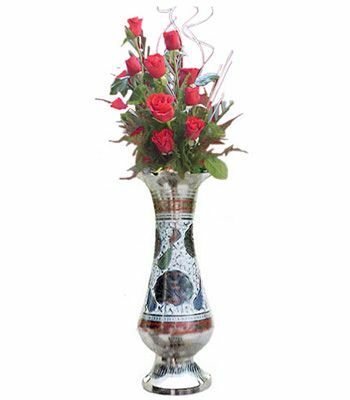 This vase with flowers can be delivered to Ahmedabad and Gandhinagar and only vase to various locations of India. This is a very elegant looking,stunning brass vase sure to stand out from the crowd. It has intricate dancing peacock designs from top to the bottom. A great gift for your home décor. You can add flowers in various numbers in red or mixed roses or mix flowers. Express your love for your near and dear ones with this classic arrangement.